The Haver Arms Harvester will be holding a fun-packed, fund-raising family event on Sunday 17th August. As part of their annual charity fund-raising initiative, Harvester Restaurants have chosen the very worthwhile Make a Wish charity. This charity grants magical wishes to children and young people aged 3 to 17 fighting life threatening illnesses. The local Haver Arms Harvester in Haverhill will be supporting this campaign with a very special event of their own. The Haver Arms action-packed charity afternoon has been organised for Sunday 17 August 2008. As well as offering fun and games for all the family, this event will include a BBQ from 1pm and Live Music from 2pm until 7.00pm. Two local bands, ‘Hoarse with No Name’ and Cover Girls’ have agreed to perform free of charge throughout the afternoon to support the initiative. Imparting even more of a local flavour, is the lead singer of one of the bands. 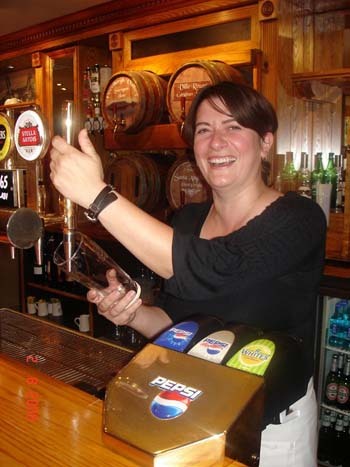 Regular visitors to the Haver Arms will recognise a familiar face from behind the bar – Emma Blackmore (that's her in the picture!). Emma, a member of Haverhill’s popular Centre Stage Company, appeared last year in the chorus of My Fair Lady and more recently in the magnificent Last Night of the Proms staged at the Old Independent Church. However, Emma’s regular band – Cover Girls – is more rock and pop than musicals and prom. Manager of the Haver Arms, Lyndsey Bucknell has been thrilled by the assistance she has received from staff, local businesses and volunteers. Lyndsey explains: ‘When I told the team here at Haverhill about our plans, everyone was really keen to get involved and support this event. However, the icing on the cake was Emma telling me that not only was she able to arrange for two local bands to perform free but that she was also the lead singer in one of them! I had no idea she had a voice to match her ability to pull pints! We are very grateful to Emma. Organisers, although hoping that the weather holds for the weekend of the 17th August, are keen to point out that it's not crucial to its success as the event will be undercover. 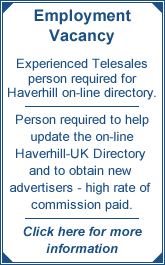 For all enquiries, please ring Lyndsey Bucknell at the Haver Arms on 01440 702208. Picture shows Emma Blackmore of 'Cover Girls' who will be appearing live at The Haver Arms on Sunday 17th August.